DeCuir-Gunby, J.T. & Schutz, P. A. (2017). 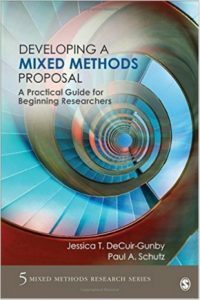 Developing a mixed methods proposal: A practical guide for beginning researchers. Thousand Oaks, CA: SAGE. Grant, S. G, Lee, J. K., & Swan, K. (Eds.). (2017). 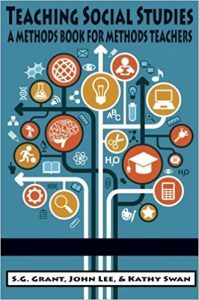 Teaching social studies: A methods book for methods teachers. Charlotte, NC: Information Age Press. Grant, S. G., Swan, K., & Lee, J. K. (2017). 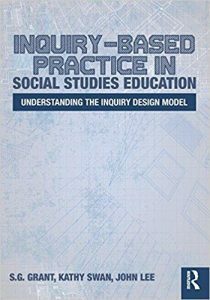 Inquiry-based practice in social studies education: The Inquiry Design Model. New York: Routledge Press. Manfra, M. M., & Bolick, C. M. (Eds.) (2017). 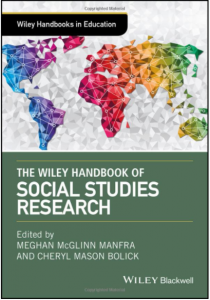 The Wiley Handbook of Social Studies Research. John Wiley & Sons. Spires, H. A. (Ed.). (2017). Digital transformation and innovation in Chinese Education. Hershey, PA: IGI Global. Young, C. A., & Moran, C. M. (2017). 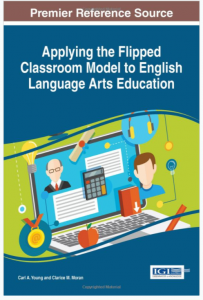 Applying the Flipped Classroom Model to English Language Arts Education. IGI Global. Carrier, S. J., Stevenson, K. T. In Kimonen, E., Nevalainen, R. (Ed. ), (2017). Children Experiencing the Outdoors: A Natural Setting for Science Learning in the United States. In Kimonen, E., & Nevalainen, R. (Eds. ), Reforming Teaching and Teacher Education: Bright Prospects for Active Schools, (pp. 67-88). Rotterdam: Sense Publishers. Davis, D.S. (2017). Learning to interrogate and resist the data culture in literacy education. In F. Blake Tenore and J.E. Justice (Eds.) Becoming Critical Educators: Narratives of Disruption, Possibility, and Praxis (pp. 38-50). New York, NY: Routledge. Anderman, E. M., Gray, D. L. (2017). The Roles of Schools and Teachers in Fostering Competence Motivation. In Elliot, A., Dweck, C., Yeager, D. (Eds. ), Handbook of Competence and Motivation: Theory and Application, (pp. 604-619). New York: The Guilford Press. McLeod, R., Grifenhagen, J. F., Hall, A. H. (2017). Blended practices for promoting literacy skills. In Grisham-Brown, J., Hemmeter, M L, & Pretti-Frontczak, Kristie (Eds. ), Blended Practices for Teaching Young Children in Inclusive Settings (pp. 247-281). Baltimore: Paul H. Brookes Publishing Co.
Goodwin, A. L. & Chen, C. (2016). New Knowledges for Teacher Educating? : Perspectives from practicing teacher educators. In C. Kosnik, S. White, C. Beck, B. Marshall, A. L. Goodwin, & J. Murray (Eds. ), Building Bridges: Rethinking Literacy Teacher Education in a Digital Era. Sense Publishers. Lee, J. K., & Chirino-Klevans, I. (2017). Cosmopolitanism in a world of teachers: American student teachers in a Chinese school. In H. A. Spires (Ed). 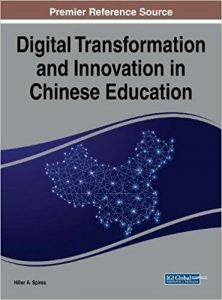 Digital transformation and innovation in Chinese education, pp 232- 248. Hershey, PA: IGI Global. Swan, K. Grant, S.G., & Lee, J. K. (2017). The Inquiry Design Model (IDM). In T. Hawley, & P. Chandler, (Eds). 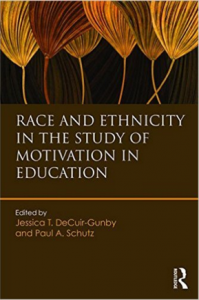 Race lessons: Using inquiry to teach about race in social studies, pp. 33-44. Charlotte, NC: Information Age Publishing. Di Francesca, D., & Nietfeld, J. L. (2017). Using Metacognitive Scaffolding to Develop Problem Solving Skills in K-12 Computer-Based Learning Environments. In J. A. González-Pienda, J. C. Núñez, A. Bernardo, & C. Rodríguez (Eds. ), Factors affecting academic performance (pp. 81-99). Nova Science Publishers, NY. Spires, H. A., & Kerkhoff, S. (2016). New literacies. In S. B. Mertens, M. M. Caskey, & N. Flowers (Eds. ), The encyclopedia of middle grades education (2nd ed., pp. 282-286). Charlotte, NC: Information Age Publishing. Thomson, M.M. (2017). A mixed-methods investigation: Involvement in a Research Experiences for Teachers’ (RET) professional development programme. In M. Gill (Ed. ), SAGE Research Methods Cases Education (pp. 2-13). London, UK: Sage Publications. Wiseman, A., Oliver, K., & Cook, M. (2017). Global professional development for inservice teachers: A focus on literacy, technology, and culture. In V. Korhonen, J. Annala, & P. Kulju (Eds. ), Steps for Development, Secrets of Communities—Perspectives to Education and Teaching (pp. 219-235). Tampere, Finland: University of Tampere Press. Kupiainen, R., Leinonen, H., Makinen, M., Wiseman, A. M. (2016). Un proyecto de libro digital con maestros de education primaria en Finlandia. In Knobel, M., Kalman, J. (Eds. ), Aprendizaje docente y nuevas prácticas del lenguaje. Posibilidades del desarrollo profesional en contextos digitales (pp. 143-167). Mexico City: Grupo SM. Young, C. A. (2016). Game on: Multiple literacies in class, online, and at play. In Brown, A., Rodesiler, L. (Eds. ), Developing contemporary literacies through sports: A guide for the English classroom. Urbana, IL: National Council of Teachers of English (NCTE). Moran, C. M., Young, C. A. (2016). Thematic units. In Mertens, S. B., Caskey, M. M., Flowers, N. (Eds. ), Encyclopedia of Middle Grades Education (ed.). Charlotte, NC: Information Age Publishing. Carrier, S.J., Hoyle, K.S., & Luginbuhl, S.C. (2017). Bringing informal science education to elementary preservice teacher preparation: Expanding the vision. Journal of Interdisciplinary Teacher Leadership, 1(3), 32-37. 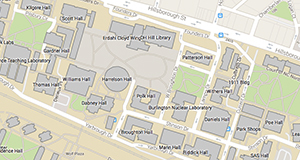 Carrier, S.J., Whitehead, A.N., Walkowiak, T.A., Luginbuhl, S.C., & Thomson, M.M. 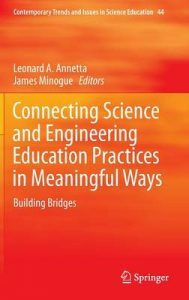 (2017) The development of elementary teacher identities as teachers of science. International Journal of Science Education, 39(13), 1733-1754. STEM project for elementary teachers. Journal of Interdisciplinary Teacher Leadership, 1(1), 25-29. Tugurian, L. P., Carrier, S. J. (2016). Children’s environmental identity and the elementary science classroom. Journal of Environmental Education 48(3), 143-153. Sailors, M., Martinez, M., Davis, D. S., Goatley, V. (2017). Interrupting and disrupting literacy research. In Willis, A. (Ed. ), Journal of Literacy Research (1st ed., vol. 49, pp. 6-9). Huang, B. H., Davis, D.S., & Ngamsomjan, R. (2017). Catching up and forging ahead: English language outcomes of proficient bilingual adolescents in the United States. System, 67, 12-24. Sailors, M., Martinez, M., Davis, D.S., Goatley, V., & Willis, A. (2017). Editorial: Literacy research in uncertain times. Journal of Literacy Research, 49(2), 155-156. Davis, D. S., Huang, B., Yi, T. (2017). 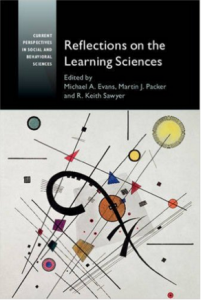 Making sense of science texts: A mixed-methods examination of predictors and processes of multiple text comprehension. Reading Research Quarterly, 52(2), 227-252. Lenski, S., Larson, M., McElhone, D., Davis, D. S., Lauritzen, C., Villagomez, A., Yeigh, M., Landon-Hays, M., LeJeune, M., Scales, D. (2016). What teachers want: A statewide survey of reading and ELA teachers’ instructional materials, preferences, and practices. Literacy Research and Instruction, 55(3), 237-261. Boulden, D. D., Evans, M. A. (2017). Teaching an Online Graduate Multimedia Design Course Using Studio-Based Pedagogy. International Journal for Scholarship of Technology Enhanced Learning, 1(2), 145-160. Won, S.G.L., Evans, M.A., & Huang, L. (2017). Engagement and knowledge building in an afterschool STEM Club: Analyzing youth and facilitator posting behavior on a social networking site. Learning, Media, and Technology, 42(3), 331-356. Beach, R., Falter, M. M., & Whitley, J. J. (2017). Making sense of events in literature and life through collaboration. English Teaching: Practice & Critique, 16(2), 207-221. Hong, X., Falter, M. M., Fecho, B. (2016). Embracing tension: Using Bakhtinian theory as a means for data analysis. Qualitative Research, 17(1), 20-36. Faulkner, V. N., Ainslie, J. (2017). Subitising through the years. Australian Primary Mathematics Classroom, 22(1), 28-36. Faulkner, V., Marshall, P. L., Stiff, L. V., Crossland, C. L. (2017). Less is more: The limitations of judgment. Phi Delta Kappan, 98(7), 55-60. Faulkner, V. N., Walkowiak, T. A., Cain, C., Lee, C. W. (2016). Equality Matters: The critical implications of precisely defining equality. Australian Primary Mathematics Classroom, 21(4), 11-15. Gray, D. L. (2017). Is Psychological Membership in the Classroom a Function of Standing Out while Fitting In? Implications for Achievement Motivation and Emotions. Journal of School Psychology 61(Supplement C), 103-121. doi:10.1016/j.jsp.2017.02.001. Grifenhagen, J. F., Barnes, E. M., Collins, M. F., Dickinson, D. K. (2016). Talking the talk: Translating research to practice. Early Childhood Development and Care 187(3-4), pp. 509-526. Barnes, E., Dickinson, D. K., Grifenhagen, J. F. (2016). The role of Head Start teachers’ commenting during book reading sessions in children’s vocabulary growth. Journal of Educational Research 110(5), pp. 515-527. Barnes, E. M., Grifenhagen, J. F., Dickinson, D. K. (2016). Facilitating academic language in early childhood classrooms. The Reading Teacher. sharing in children who experience low achievement in mathematics: Competence in context. Education Sciences, 7(1) 1-14. Throndsen, J., MacDonald, B., & Hunt, J.H. (2017). A kindergartener’s reasoning when developing cardinality of number. Australian Primary Mathematics Classroom, 22(2), 21-25. Hunt, J. H., Welch-Ptak, J., Silva, J. (2016). Initial understandings of fraction concepts evidenced by students with learning disabilities and difficulties: A framework. Learning Disabilities Quarterly 39(4) 213-225. Hunt J.H., Tzur, R., Westenskow A. (2016). Evolution of unit fraction concepts in two fifth graders with a learning disability: An exploratory study. Mathematical Thinking and Learning, 18(3) 182-208. Hunt, J.H., Westenskow, A., Silva, J., & Ptak, J.W. (2016). Levels of participatory conception of fractional quantity along a series of equal sharing tasks: Stu’s trajectory. The Journal of Mathematical Behavior, 41, 45-67. Hunt, J.H., Valentine, C.A., Bryant, D.P., Pfannenstiel, K., & Bryant, B. (2016). Supplemental mathematics interventions: How and why special educators intensify interventions for students with learning disabilities. Remedial and Special Education, 37(2), 78-88. Koch, J. G., Jeffries, M. J. (2017). Cultivating Culturally Relevant Classrooms. 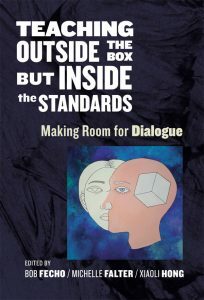 Dialogues: An Interdisciplinary Journal of English Language Teaching and Research, 1(1) 71-76. http://dialogues.ojs.chass.ncsu.edu/index.php/dialogues. Roegman, R., Pratt, S., Sanchez, S. & Chen, C. (2017). Between Extraordinary and Marginalized: Negotiating Tensions in Becoming Teachers of Students with Labeled Disabilities. The New Educator. 1-22.
methods study of teaching residents’ beliefs and articulations of teaching for social justice. Teaching and Teacher Education, 59, 213-227. Possibilities for African Immigrant Girls. Education Leadership Review. 16(3), 34-41. Swan, K., Lee, J., & Grant, S. G. (2016). A study of state social studies coordinators׳ views of the Common Core. Journal of Social Studies Research, 40(4), 263-279. Manfra, M. M., & The Connecting Carolina Team (2017). “The Connecting Carolina” teaching with primary sources program. Social Education, 81(2). Manfra, M. M., Greiner, J. A. (2016). Technology and disciplined inquiry in the world history classroom. Social Education, 80(2). Manfra, M. M., Saylor, E. (2016). Which woman should appear on U.S. currency? Using primary sources to explore important historical figures. Social Studies and the Young Learner, 29(1). Brewer, J., Kretchmar, K., Sondel, B. L., Ishmael, S., Manfra, M. M. (2016). Teach for America’s preferential treatment: School district contracts, hiring decisions, and employment practices. Educational Policy Analysis Archives, 24. http://epaa.asu.edu/ojs/article/view/1923. Braten, I., Lien, A., Nietfeld, J. L. (2017). Examining the effects of task instructions to induce implicit theories of intelligence on a rational thinking test: A cross-cultural study. Zeitschrift für Psychologie, 225, 146-156. Ersozlu, Z., Nietfeld, J. L., & Huseynova, L. (2017). Predicting preservice music teachers’ performance success in instrumental courses using self-regulated study strategies and predictor variables. Music Education Research, 19, 123-132. DiFrancesca, D., Nietfeld, J. L., Cao, L. (2016). A mixed methods comparison of high and low achieving students on self-regulated learning variables. Learning and Individual Differences, 45, 228-236. Oliver, K. M. (2016). Promoting continuing computer science education through a massively open online course. Journal of Computers in Mathematics and Science Teaching, 35(4), 331-344. Pruden, M., Kerkhoff, S., Spires, H. A., Lester II, J. C. (2017). Enhancing writing achievement through a digital learning environment: Case studies of three struggling adolescent male writers. Reading and Writing Quarterly, 33(1) 1–19. Graham, A., Kerkhoff, S., & Spires, H. A. (2017). Disciplinary literacy in the middle school: Exploring pedagogical tensions. Middle Grades Research Journal, 11(1). Spires, H. A., Himes, M., Wang, L. (2016). Cross-cultural inquiry in science. Educational Leadership, 74(4), 72-74. Spires, H. A., Himes, M., Lyjak, E. (2016). Connecting classrooms to the future: Developing cross-cultural understandings through project-based inquiry. Literacy Today, 34(1), 26-27. Spires, H. A., Kerkhoff, S. N., Graham, A. C. (2016). Disciplinary Literacy and Inquiry: Teaching for Deeper Content Learning. Journal of Adolescent and Adult Literacy, 60(2), 51-61. Thomson, M. M., & John, N. L. (2017). Knowledge, monitoring, and beliefs: A comparative analysis among preservice teachers from three different STEM-focused programs. Journal of Interdisciplinary Teacher Leadership, 1(2), 19-27. Thomson, M. M., DiFrancesca, D., Carrier, S. J., Lee, C. W. (2017). Teaching efficacy: Exploring relationships between mathematics and science self-efficacy beliefs, PCK and domain knowledge among preservice teachers from the United States. Teacher Development, 21(1), 1-20. Thomson, M.M. (2016). Metaphorical images of schooling: Beliefs about teaching and learning among prospective teachers from United States displaying different motivational profiles. Educational Psychology, 36 (3), 502-525. Thomson, M.M., & Nietfeld, J. (2016). Beliefs systems and classroom practices: Identified typologies of elementary school teachers from the United States. The Journal of Educational Research, 109 (4), 360-374. Lee, C. W., Walkowiak, T. A., Nietfeld, J. L. (2017). Characterization of mathematics instructional practices for prospective elementary teachers with varying levels of self-efficacy in classroom management and mathematics teaching. Mathematics Education Research Journal, 29(1), 45-72. Walkowiak, T. A., Minogue, J., Harrington, A. D., Edgington, C. P. (2017). Re-envisioning the school day: Integrating mathematics, science, and reading through students’ engagement with practices. Journal of Interdisciplinary Teacher Leadership, 1(2), 7-12. kenanfellows.org/journals/index.php/JOITL/article/view/23. Walkowiak, T. A. (2016). Building proportional reasoning across grades and math strands, K-8 (Book Review). Teachers College Record. Larson, C., Wilson, J., Larbi-Cherif, A. (2017). Instructional Improvement and Teachers’ Collaborative Conversations. Teachers College Record, 119(3). Wiseman, A. M., Kupianinen, R., Makinen, M. (2016). Literacy through photography Multimodal and visual literacy in a third-grade classroom. Early Childhood Education Journal, 44(5). Stevenson, K., Peterson, M. N., Bondell, H. D., Carrier, S. J., Moore, S. E., Strnad, R. Climate Change Risk Perception Among Adolescents. Presentation. Refereed. Thomson, M. M., Walkowiak, T. A., Lee, C. W. (2016). In Wahid, L. A. (Ed. ), A mixed-methods investigation of teacher developmental trajectories: Results from a STEM-focused program. Proceedings of the Fifth International Conference on Language, Education, and Innovation (pp. 121-135). London: ICSAI. Refereed. Lee, C. W., Walkowiak, T. A. (2016). In Wood, M. B., Turner, E. E., Civil, M., Eli, J. A. (Eds. ), Teacher attributes and school context: What are the barriers to discourse in elementary mathematics? Proceedings of the 38th Annual Meeting of the North American Chapter of the Psychology for Mathematics Education (pp. 1244-1251). Tucson, AZ: University of Arizona. Refereed.